The release of iOS 10 is just around the corner. I’ve been running the public beta on my phone for a few weeks, and I think it’s going to be an incredible update. It’ll be even better once I can run it with watchOS 3, but that’s neither here nor there. All the UI tweaks, features, and simple improvements have made using my iPhone so much easier and more pleasant, with one exception. That is: the Music app. I won’t deny that the iOS 10 Music app is a huge step up from the convoluted mess that was iOS 9.3’s Music app. I can actually figure out how to navigate, control the playback queue, and find my music. The new interface is also a lot more visually appealing. I’m a big fan of the new, bold San Francisco font used for section headers. It looks and it works great, though it’s not likely to sway me back from Cesium any time soon. The problem I have with the Music app can be summarized in one screenshot. I have highlighted the offending feature, in case you missed it. If I want to view only my locally stored, downloaded music, there is now a separate menu option. For everything iOS 9.3’s Music app got wrong, and boy did it get a lot wrong, there was at least a simple toggle that would hide all my cloud and iTunes purchases not stored on my phone. It didn’t work all that often, but at least it was there. Apple showed they cared, just a little, about us legacy luddites who still synchronized music to our phones over USB like an animal. And to be honest, after the last time I tried Apple’s cloud music solutions, I’m going to stick with syncing until Apple takes it away. Replacing the “Downloaded Music” toggle with a menu option means there is now an additional step between me and getting a view into the music I keep on my phone. It’s additional friction, and it renders the music synced and stored on our devices to second-class citizen status. Showing me all the artists and albums I bought on iTunes, even if I don’t have them on my device, is not a benefit. There is a reason I didn’t sync those songs to my phone. Limited space forces me to keep only a subset of my library, the music I know I’ll want to listen to most often. This is fine. If I want to listen to something I don’t normally keep on my phone, I’ll sync it. And before you ask, yes, I already filed a Feedback report. I think it’s fine for Apple to create a Music app that puts streaming and the cloud first. This is the future, and how most of Apple’s users listen to their music. Fine. It’s a future I want no part of, until they drag me there, kicking and screaming, but I admit it’s the future. That doesn’t mean the streaming and cloud first Music app needs to leave local music users as second class citizens. 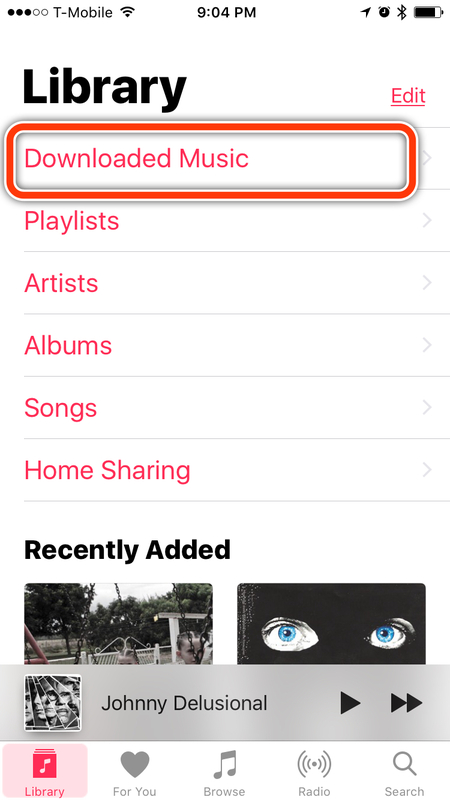 A toggle is a simple way to streamline and keep the iOS Music experience pleasant for users who don’t stream or have poor connectivity. You can’t stream music in a subway tunnel with no cellular or wi-fi connection. And let’s not forget those poor iPod Touch users. You might think I’m just complaining about a zeroth-world problem, and I might be. Despite it, music is something I’m passionate about. It’s a huge part of my life. My music listening habits are strange and idiosyncratic in an age where everything is streaming, but they’re mine. And I know I’m not alone. Just make local music a toggle again, Apple. It’s not hard—you already did it once. You can call it perfect timing. A couple of weeks ago, I decided to try iTunes Match, the iTunes in the Cloud solution that doesn’t involve Apple Music and subscription streaming. After using it on two Macs and my iPad for a few days, I found that some of my favorite albums and songs were being matched with the wrong versions, yet again. In response, I rage quit and got a refund. I’d never been quite so upset with an Apple product in my life. Then, I came across this sad piece by James Pinkstone whose library was destroyed by an Apple Music and iTunes bug. A week after that, MacRumors reported that Apple was planning to end music downloads in two years. The rumor was squashed by an Apple spokesperson, and that was enough for many. Not me, though. “What if?” has been running through my mind since. I’ve written before about why I choose to own music in a streaming world, but I never felt as though my music collection would be taken from me. Now, I’m not so sure. Maybe music downloads will go away, and maybe the future of iTunes will be cloud first, and local files somewhere below Connect, but above syncing ringtones. But the looming threat of a streaming only world opens up a bigger question about music ownership and the experience of music. I’ll be the first to admit that all forms of physical media are a huge pain the rear. LPs, CDs, and cassettes are all fragile. Digital files are less fragile, but just as annoying to organize and sync. I keep an external hard drive tethered to my MacBook just to store my media library. I have more music than could fit on the largest of iPhones. Managing this is a hassle. Yet, these forms of music media are real in a way that streaming music is not. There are digital files in my collection that are over a decade old. They’ve traveled with me across multiple computers, and multiple lives. This is meaningful in a way that streaming can never be. How do you connect with music that you simply rent, and could disappear from your library the moment you turn your back? A record label dispute could mean that your favorite artist’s music might be locked down to a single streaming service—such as the library of the dearly departed Prince. It feels like the move to streaming music means we’re losing something. What happens to music that isn’t available on a streaming service? How will you explore the music of a surprisingly good opening band when they don’t exist in the library of Apple Music, Spotify, or TIDAL? So much music that has touched my soul, you can’t stream it for love or money. I had to seek it out on my own, pawing through used music bins, or going to shows. When there’s an all-you-can eat buffet for $9.99, what’s the incentive to order something that isn’t on the menu? Maybe I’m becoming a fossil, but I can’t help but worry. Music is one of the most personal forms of art in the world. The way we relate to it cannot be isolated to files stored somewhere remotely. There’s the thrill of discovery, the emotional connection to lyrics, a voice, or even a single sound. By owning my music library, I make sure that I can maintain those relationships to the art. I should never have to worry that, if I double-click an album in iTunes, I will hear the wrong thing. If I do, I know that restoring order is within my grasp, not something that requires technical support calls and arcane rituals. I may, eventually, be left behind by a streaming world. I don’t expect I’ll be alone. If the world goes on without me, and I am left to my digital files, and my collection of plastic and wax discs, I will be okay. But there’s a big difference between being left behind, and being abandoned, and it’s the latter that scares me to death. If you care about music in any tangible form, it should scare you as well. Back in the late 90s, or early 2000s, there was a commercial for some telecom company where a man checks in to a remote desert motel. He asks the clerk about the place’s amenities, to which the clerk lackadaisically relays a distinct lack thereof—save one. They apparently have every movie, In every language, ever made, and on-demand. “How is this possible?” asks the man, before we smash cut to a logo and a pitch that some day, in the future, this would be possible. The future came, and suddenly every movie was at our fingertips. And then, just as suddenly, every movie was locked behind one of a dozen streaming video services. For $9.99, you can sign up of Netflix, and watch what they have. For another $9.99, you can sign up for Hulu, and watch that. There’s more: Amazon Prime Video, HBO Now, Crackle, Vudu… the list goes on. Some of these services libraries overlap, but there are endless exclusives and no end of complaining from cord-cutters about content going away from the one they’ve paid for. And these same voices often love their music streaming service, just like they loved Netflix back in the day. Unfortunately for them, it’s inevitable that the same forces that fractured the landscape of streaming video are going to do the same for streaming music. When it does, all you streaming partisans will not be very happy. The seeds have already been sown. There are artists who are holding out on different streaming services. Prince, for example, only allows his music to be streamed on Tidal. The music video for “Hotline Bling” was originally an Apple Music exclusive. Taylor Swift pulled her music from Spotify due to royalty issues. For the most part, though, music streaming licenses are handled on the label level, much like video content is handled on the studio level. What happens when a label decides they don’t like the deal, Spotify is giving them? Imagine Universal Music Group pulling their entire catalog from Spotify. Here is a list of UMG artists, though I don’t know if that includes artists in their subsidiary labels. I bet there is at least one artist on that list that you’re a fan of. If you want to listen to them, you will have two choices: either buy the record, or pay for a second streaming service. And that’s only if the record is available to even be bought. The next step is going to be streaming music services becoming music labels of their own. We already have digital exclusives, sometimes even locked to one digital music store, but these are often temporary. But, say Taylor Swift signs a deal with Apple to release her next album exclusively on Apple Music. No physical release. Not even a download. If you want to hear the new T-Swift record, you have to pay $9.99 a month for Apple Music. What are her fans going to think? If they’re signed up to Apple Music already, they’ll be okay with it. If they’re on Tidal… well, how would you feel?